Moving Checklist: Does the TV Mount Stay or Go? When relocating either near or far, there are so many tasks on your moving checklist, including what to do with your internet and cable/dish providers, and what to do with your TV wall mount... Should you disassemble it and take it with you? Or leave it in place for the next resident? If you currently live in a rental, it was nice of your landlord to allow you to install a TV mount. But unless he or she wants to buy it from you, you’ll have to take it down and pack it. That means you’ll also need to repair the holes in your drywall. If you’re selling your house, leaving the TV mount as is will be the easiest thing to do. You won’t have to take it down, pack it, or patch the wall. Be aware that in some cases, a mount is seen as a fixture that is required to stay when selling a home, so speak with your agent to clarify whether or not you are able to take it with you should that be your choice. Leaving it might also sweeten the pot for potential buyers, because it’s an attractive “extra” — the new owners won’t have to figure out the best viewing spot or do the work to install their own mount. That’s why many real estate experts recommend leaving it behind. You may want a different type of TV mount in your new home, because key factors will be different — room size, traffic patterns, furniture configuration, issues with glare or reflections, etc. Or maybe your moving checklist includes "upgrading the TV.” A new home is a perfect excuse to get a newer or larger TV for your primary viewing room. In that case, you can relocate your current TV to a bedroom, the bonus room, the kitchen, even the bathroom. This increases the likelihood you’ll need a different mount. Every moving checklist includes packing. If you’re taking the mount, put the screws in a Ziploc bag and pack it with the mount, along with the cables and remotes associated with your TV and home theater equipment, so everything stays together. Mark the box clearly. Use your smartphone to take a photo of the back, showing all the cable connections. Do the same for other components. Before you disconnect anything, label each input and its corresponding wire with different colored tape (or use pieces of masking tape and write on them). In your moving truck, pack the TV box between large flat items – not high where it could tip or fall. Don’t load anything heavy on top of it. Did You Remember To Order New TV and Internet Service? One of the necessary evils of moving is calling your cable and internet provider to move your services to the new address. But it is also the perfect time to renegotiate your rates. Are you able to get a better deal with the move? Don't be afraid to ask! Or is moving the perfect opportunity to say goodbye to cable for good and start streaming all of your media? Using services like Netflix and Hulu for all of your entertainment needs may acutally save you money when compared to a traditional cable bill. Whichever type of service you select, the sooner you get these vital services up and running, the sooner you’ll be able to watch your favorite shows and movies – the perfect way to complete your moving checklist and relax after a tough day of unpacking. Cutting edge innovation for AV enthusiasts and professional installers. 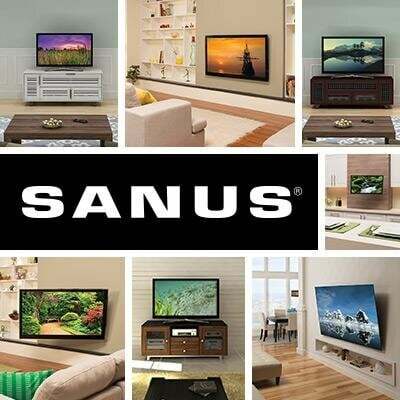 Includes a complete selection of TV mounts, furniture, speaker stands, racks and more! © 2016 Milestone AV Technologies. All rights reserved.